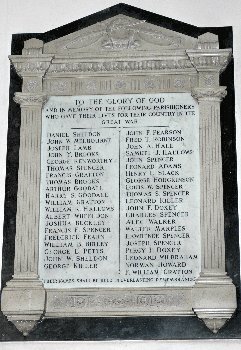 Photos of these Memorials from the 1st World War were sent by Keith Brooks, thanks Keith. An attempt has been made to locate as many names as possible in the 1901 Census, to discover their age and background. Holy Trinity Church at Middleton. "Their names shall be held in everlasting remembrance"
These links to the CWGC casualty details were supplied by David Wardman, who writes: "When I started searching for the links, only about a dozen or so were obvious. However on examining the fallen dates for that dozen, they were in date order. So whoever organised the memorial must have had full details of when all the men fell, and duly designed the memorial around fallen date order, as opposed to the Wirksworth Memorial which is in surname alphabetical order. Hence on doing a subsequent search armed with the knowledge of the narrow window (possibly only a few days) when a man had fallen, things clarified. The memorial lists men who went to war from Middleton not having been born there but had presumably married into a Middleton family and were living there, and also men who were born in Middleton but had emigrated and went to war from Australia and Canada. The date of 17/06/1916 must be remembered as a grim one for Middleton, comparable to 01/07/1916 for Wirksworth, when in both cases 3 men fell". 21. 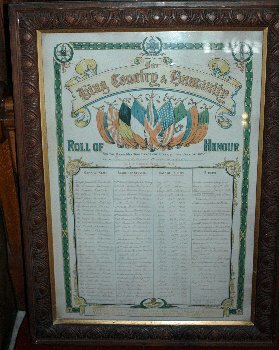 Pte Ernest Bunting - Highland Light Infantry - Nov 23rd 1916 - 9 months prisoner of war (X553).